I’ve been a fan of the Canon EOS M-series since it was introduced in 2012. After several iterations the camera bodies and system have come a long way, but in some respects still lag behind competitors. When the EOS M5 was announced September 15, 2016, I was intrigued, but did not instantly consider an upgrade from the M3. I mostly shoot landscape photographs. The EOS M5 sensor size and quality is essentially unchanged form the M3 and while the addition of dual-pixel (phase-detection) auto-focus (DPAF) to the M5 is fantastic I wasn’t sure if it would benefit me. One of the best (and for some photographers, most annoying) features of the M3 is the optional/detachable tilting electronic viewfinder (EVF). I spent many years shooting exclusively with my iPhone and the Canon PowerShot S-series of compact cameras. When I started shooting with the original EOS M I did not miss a viewfinder at all, and, unlike many, had no problem shooting exclusively with the fixed rear screen. Thus, I felt the M3 gave me that best of both worlds: an ultra-compact inter-changeable lens camera (ILC) and the ability use a viewfinder when needed. I cannot understate how amazing the tilting function of the EVF is on the M3. It works so wonderfully at chest-level, when using a compact tripod, or for shooting ground-level landscapes and macros. While I was looking forward to a more substantial grip on the M5 (I do occasionally shoot with larger EF lenses via the EF to EF-M adaptor), I was concerned about the added bulk of the built-in EVF and the lack of EVF tilting. The other area of concern turned out to be a non-issue exacerbated by poor reviews. The M3 rear screen tilts up 180 degrees and down 90 degrees. While I have no interest in selfies, having a screen that tilts both up (for use on small tripods, at chest level, and low angle) and down (for shooting high-angles) is now essential for me. On the M5 the screen now tilts down 180 degrees, but every review (while quick to point out the selfie compatibility and video-blogger incompatibility of this camera) omitted wether or not the screen tilted up at all. A screen that does not tilt up seems like nonsense, but I thought maybe the EVF eyepiece interferes with tilting up in someway. This would have been a deal breaker for me. Alas, the M5 rear screen does tilt up 85 degrees (90 degrees would be better but the EVF would then be in the way a bit). Having a very compact option already in the form of the M3, I was most interested in the M-series including a beefier premier body that borrowed more form Canon’s enthusiast DSLR bodies. Let’s review my wish-list from last year and see if the M5 delivers. use the same battery size as M3, please — check, yeah! better than 4 frames RAW buffer (unlimited would be ideal) — check, 17 RAW or 26 large JPEG shots. button function assignment was not as flexible as it should be — much improved, almost any button can have any assignment (except the * button which is either exposure lock or focus in several different combinations along with the main shutter button). The multi-function top control dial and DIAL FUNC. button borrowed from the G-series and S-series is a brilliant addition. not all menu items were saved in the Custom shooting mode, making it pretty useless — fixed, all shooting menu settings and anything added to MyMenu, including Custom Function items, can be saved in either C1 or C2. market leader (particularly in sports and editorial segments) and seem loathe to make radical changes to there camera body lines for fear of alienating their user base or, worse, messing up their profit margins. This is the common opinion in the blogosphere anyway. In some respects I agree, but am a little more lenient. While Canon does seem to be a little cautious, they have actually been iterating quite quickly for the past three years. Proven features from pro-/enthusiast-DLSR bodies are trickling down the line and innovative functions from lower camera lines are being adopted by higher-end bodies. To me, the M-series is the middle ground where proven DSLR tech and innovations like touch-UI or the multi-function control dial can merge. Canon don’t often offer firmware updates with feature additions, unlike, for example, Fujifilm. Canon firmware updates usually address performance issues (like the update to the original M which significantly improved AF). As cameras continue to be more about software choices though I can see this changing for Canon. 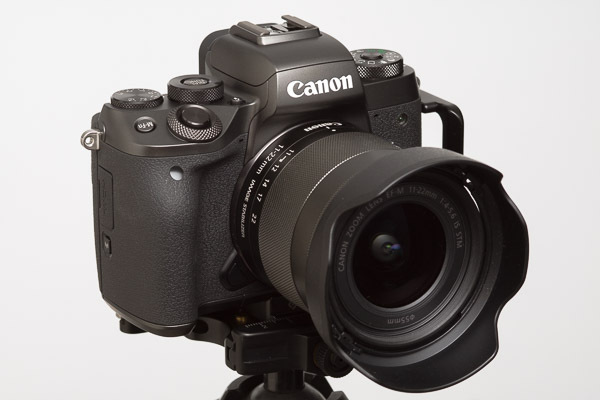 The fact that 11 of my fourteen wish-list and gripe-list items have been addressed in the EOS M5 show that Canon is, in some way, listening to its customers. (Also, none of my favourite features were removed. Yeah!) The three items that were not address (built-in GPS, tilting EVF, and vertical grip) are mostly forgivable omissions. I’d really like the grip, but understand the market for this accessory might not be substantial. The DPAF system is a welcome if obvious improvement on the M5. The flagship M-body should always have Canon’s flagship live-view technology. Full-stop. When shooting with the EVF the M5 allows you to use the touchscreen as a touch-pad control of the autofocus point (Touch & Drag AF). You can choose to use the full screen as the touch-pad, half the screen, or any quadrant. You can also choose to select the focus point via absolute position (like touching a smart phone display) or by relative position (like a laptop trackpad). I use the right-half of the screen in absolute mode and it is brilliant. The M5’s subject recognition and tracking is pretty good, but Touch & Drag AF makes it so much better we will soon wonder how we ever shot without it. At the moment it is class leading. (Canon’s touchscreen adoption has always been one of the primary reasons I have chosen their MILC and compact cameras over Sony’s). The M5’s improved auto-focus system (especially with adaptor-mounts lenses) combined with the EVF and easier to hold body led me to bight the bullet and acquire a Tamron SP 150-600mm f/5-6.3 Di VC USD G2 super-telephoto zoom lens. I’ve wanted a lens in this class for a while but it never made sense on the smaller M-Series bodies. With he M3 I could really only wrap two fingers around the grip while my index finger was on the shutter button. With the M5 I can wrap three fingers around the grip — a big improvement that facilitates hand-holding this long lens. The M5’s increased FPS and shot buffer also facilitate more action oriented shooting. Canon’s smartphone integration has always been okay (better than competitors I understand) but not brilliant. The inclusion of Bluetooth LE and ability to use the iPhone as a wireless remote control is a nice addition to the M5. The Bluetooth remote is much faster than initiating a Wifi connection and even faster than digging my wireless remote out of the camera bag. I don’t do a lot of studio shooting these days, and when I do I use my Speedlites 90% of the time, but occasionally I need to use my studio strobe lights. With the M3 it was difficult to use strobes because, while the exposure was set to match the flash, composing and focusing used the much dimmer modelling lights and the screen/viewfinder image appeared very dim. With optical viewfinder (OVF) cameras the viewfinder is always as bright as it can be. The M5’s “Exposure simulation” setting allows you to turn of screen dimming with slow shutter speeds or smaller apertures so the screen/viewfinder remains bright under the modelling lights. The M5 EVF shows a nice combination of information. It is not huge though and with glasses on I struggle to see the corners of the image in the EVF. Luckily the “VF display format” setting allows you to shrink the sensor image display by about 80% for greater eye relief. (The side shooting info icons stays in the same absolute position when the image display is shrunk, now displayed on black for better contrast. The bottom shooting exposure data is always displayed on a black bar at the bottom of the EVF.) It’s little customizations like this that make an EVF more flexible compared to an OVF. The M5 is the first in the M-series to include Auto ISO. The control of this feature is limited however, providing only the ability to set the maximum automatic ISO. This is very far behind the competition. Frankly, I have never understood what all the fuss of Auto ISO is about. I shoot in Manual exposure mode 99% of the time. Occasionally I use Aperture or Shutter priority but I am rarely satisfied with the results. I understand Auto ISO gives you better creative control, letting you to lock in both the shutter speed and the amount of desired depth of field while allowing the camera to deal with changes in scene brightness, however, I feel that if you want that level of control you are better off switching to full manual exposure. People who swear by Auto ISO also tend to put a high importance on a dedicated Exposure Compensation dial, as this seems to be how they control the brightness of the image. Doesn’t an easy to change ISO dial do the same thing? If Auto ISO (or Av or Tv) was so brilliant then I’d expect it to handle gross scene brightness changes such as the subject moving from direct light to shade and during burst shooting each frame should have relatively similar exposures. This is not the case though and when I shoot auto-anything bursts I too often end up with the best composed frame being over or under exposed and the best exposed frame being the one with less than perfect composition/timing. On the M5 the top control dial can be set to default to ISO adjustment. Thus a photographer can have a dedicated shutter speed dial (front main dial), a dedicated aperture dial (rear dial), and a dedicated ISO dial (top dial). Adjust for brightness using the ISO dial rather than the exposure compensation dial. I judge exposure via the histogram 99% of the time. I make sure the whites are not clipping (except if a light source is in the scene) and boost my shadows in post-processing if needed (which is most of the time for average- or high-contrast scenes). I don’t understand why there is not an option to indicate over/under-exposure on the histogram.1 I can’t quickly check both the histogram and exposure indicator since they are always on opposite sides of the display. Thus I use the over/under-exposure indicator as a secondary indicator at best and don’t often use the exposure compensation dial. If I did use auto-exposure more often then perhaps I would care if Auto ISO had more configuration options. As it is, I don’t. New to the M5 is in-camera RAW processing (also added to the G7 X Mark II which makes a tempting upgrade). I shoot RAW 99.99% of the time. The only time I shoot JPEG is if I use the built-in HDR function or if (in the past) I needed a faster burst rate. When Canon started including Wifi on there bodies I switched to shooting RAW+JPEG when travelling without a laptop so I could easily transfer images to my iPhone/iPad for mobile sharing. I’d delete the JPEGS once transferred to the computer. Adobe Lightroom Mobile’s support for RAW images and processing largely make the RAW+JPEG workflow redundant. Now, with in-camera RAW processing I can just shoot RAW and generate JPEGs in camera for the few images I want to share but don’t want to bother processing in Lightroom Mobile. Less wasted card space. Less wasted buffer and camera processing. Faster desktop offloading. The M5 is limited to 1080p video. I personally think 4k video is overkill the majority of the time and frankly I maybe shoot 3 minutes of video a year (and use about 15 seconds of that), so video features mean little to me. I can imagine that Touch & Drag AF would be particularly useful for shooting video as other reviewers have stated. The M5 does include 5-axis in-body image-stabilization (IBIS) for video only, adding stabilization to non-stabilized lenses, or better stabilization to compatible already stabilized lenses. I have not tested this functionality but it is nice to know it is there. After several weeks of almost continuous use I haven’t found too many problems I’d like to see addressed in future iterations or firmware updates. The M5 is a solid camera. I so rarely use the built-in flash I wouldn’t mind sacrificing it to have a tilting EVF. Besides low-angle macro/landscape work, a tilting EVF is handy for chest-level shooting. I am a bit over average height and shooting people from eye-level means either looking down on my subject or getting a soar back. This is a major reason why many famous photographers, including Diane Arbus, Cecil Beaton, Robert Capa, Robert Doisneau, Alfred Eisenstadt, Vivian Meier, Imogen Cunningham, and Richard Avedon used Rolleiflex TLR cameras — people should generally be shot straight-on and this means lower than photographer eye-level. Of course, on 35mm or APS-C, a tilting EVF would not help in portrait orientation, and a solid hot shoe is always a higher priority. Even though the AF and drive system of the M5 is much improved over its predecessors, the M5 still lags (pun intended) behind the competition when it comes to screen blackout during continuous shooting. EVF will never replace OVF for sports and action until this is sorted out. Its an industry-wide problem, but Canon should be at least as good as the strongest MILC competition at this point. By default the M5 is configured to automatically switch between the EVF and the rear screen display when the camera is raised/lowered. This is facilitated by a proximity sensor near the EVF. The auto-switching function works great if the rear screen is used in the flat/stored position. If I tilt the screen up, then my thumb tends to trigger the proximity sensor often, which is nothing but annoying. 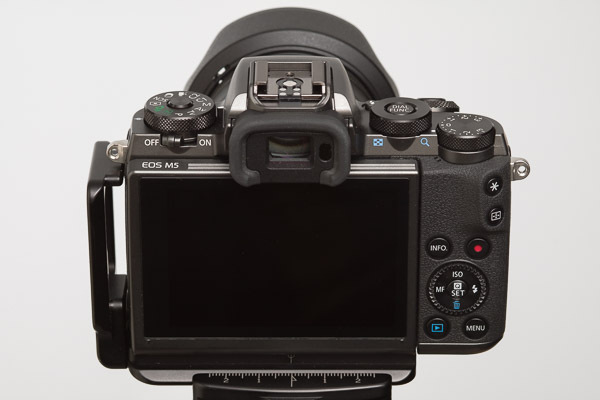 In reality, the camera should switch to the rear screen anytime the screen is moved from the stored position as the EVF physically cannot be used. This is something that can be fixed with a firmware update and has been noted by other reviewers. For now, I have turned off the auto-switch and assigned a manual switch to the trash button during shooting (I have to remember to switch screens before entering playback mode). In playback mode the DIAL FUNC. button is inactive and the top control dial is dedicated to increasing/decreasing magnification, which defeats the purpose of having a MULTI-FUNCTION dial. 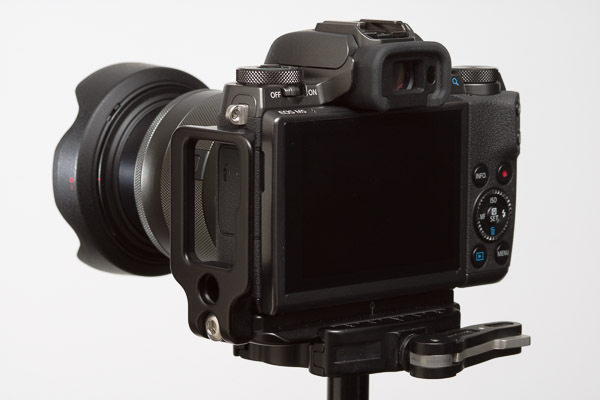 And since I can assign magnification to the * and AF Point buttons I would like to be able to assign another function, such as EVF/Screen switching to the top control dial. During playback other possible assignable functions of the top control dial include star-rating, image protection, rotation, creative filters, etc. And off course magnification. The G7X has a nice feature in Playback mode called Touch Actions. When viewing a recorded image you can touch and drag up or down and then towards one of the screen corners to select a user-assignable action (e.g., favourite, protect, erase, rotate, send to connected device, or jump through images). For the travelling photographer these functions are very handy as a lot of image editing and management takes place in-camera. I am shocked that the M5 does not have this feature. Touching the big, beautifully touchscreen during playback does nothing but scroll through images or an image index. 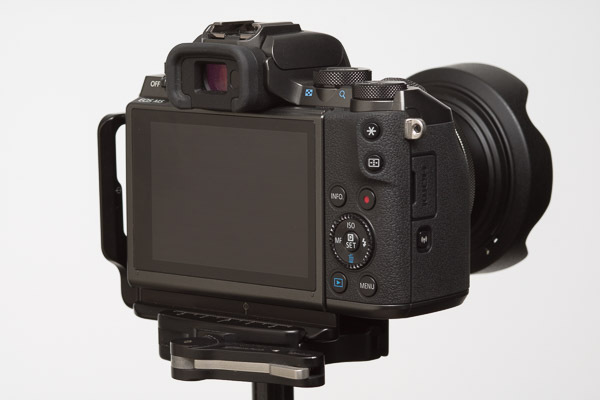 The EVF is not a barrier to adding Touch Actions as the rear screen could still be used as a touchpad, vis-a-vis Touch & Drag AF, during playback. The EF-M lens line-up continues to grow but there a few obvious gaps. The lens that came in my M5 kit, the 8.3x super-zoom EF-M 18-150mm 1:3.5-6.3 IS STM, is another nice addition. With this lens I don’t have to choose which zoom range to carry, though probably with the trade-off of a bit of speed and sharpness. This lens is not natively supported by Lightroom yet and I am still in the process of creating a custom lens profile so I haven’t come to any hard conclusions about it. The compact Canon EF-M 28mm F3.5 Macro IS STM is also interesting lens, but I have not yet had a chance to try it out. The big gap in the EF-M lens line-up is obviously fast-anything. The 22 f/2 is the lone prime in the line-up but it is relatively slow focusing. The following wide/normal primes in f/1.8 or f/2 would be welcome options: 15mm, 18mm, 35mm (equivalent to 25mm, 28mm, and 56mm respective in FF). A fast f/1.4 or f/1.8 portrait lens would also be appreciated, in the 55mm range (an 85mm FF equivalent). The current line-up of image-stabilized zooms are compact and good for all-round photography, but for lower light and action (indoor and sports) a fast f/2.8 suite would be ideal: 11-22mm (2x), 18-55mm (3x), 55-165mm (3x). The majority of the Canon EF-M lens lineup as of the end of 2016. From left to right: 22m f/2 pancake, 11-22mm f/4–5.6 wide-angle zoom, 18-55mm f/3.5–5.6 standard zoom, 18-150mm f/3.5–6.3 telephoto super-zoom, and 55-200mm f/4.5–6.3 telephoto zoom. The EF-M 28mm f/3.5 macro and 15–45 mm f/3.5–6.3 zoom are not shown. The Canon EOS M5 is a significant update over its predecessor, the M3, and is arguably Canons first formidable entry in the MILC market. It is also a very well-built, adaptable, and enjoyable camera in its own right. Initially I hesitated to upgrade, but now I will not likely be using my M3 except when I need a very compact camera body or a back-up (the M3 image quality is essential the same as the M5). I’d still be interested in a full-frame mirrorless interchangeable lens (MILC) body from Canon. We mays see this in 2017 or early 2018. There are currently rumours of a Canon EOS M6 announcement slated for this month, but not many details about what that body might entail. The over/under exposure indicator is a logarithmic scale while the histogram is a linear scale, so one indicator can’t really take on both rolls. However, it would be nice to see at least a pointer indicating mean exposure as part of the histogram. For centre-weighted average exposure metering the pointer would essentially indicate the weighted-mean of the histogram. For spot metering, the pointer would indicate the location of the measured spot brightness relative to the rest of the histogram. I haven’t posted much here recently for two reasons: 1) I’ve been having too much fun with our now 14 month-old baby; 2) when not hanging out with the baby I have been shooting as much photography as possible. 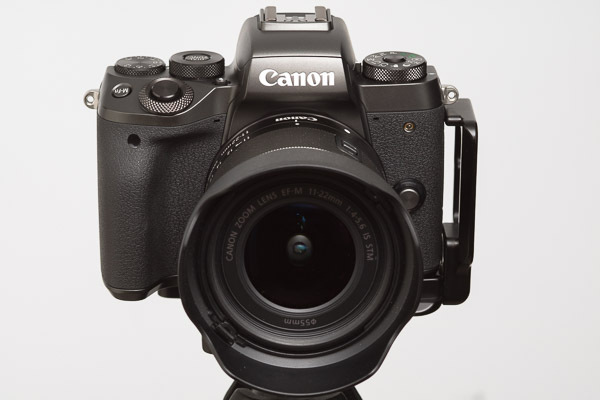 Recently on Canon Rumors a thread was started which posed the question: What do you want to see in the EOS M system? I have been a fan of the EOS M system from the beginning, so here are my answers to this question. I bought the EOS M as soon as it became available and the M3 as well. I have all the EF-M lenses and a half dozen EF L and non-L lenses as well (macro, fisheye, long zoom, etc.) Canon was running a deal when I got the M3 where they were giving away a free EF to EF-M adaptor, so that was nice (now I have two to play with). Anyway, I’ve given this topic a lot of thought. the EVF contacts in the hotshoe broke support for the GP-E2 GPS receiver (doesn’t even work attached via USB). I geotag everything I shoot outside, but now I have to use tracks from my Garmin watch. I travel a lot and spend a lot of time hiking/skiing or in the back-country on extended trips. I would never carry an SLR body. If weight/space is really an issue I might carry only a G7X, but ideally I carry the M3 with a few EF-M lenses, depending what I expect to encounter. For dedicated shooting days I throw in whatever EF lenses I need as well. I have no problem with the bulk of EF and the adaptor on the M3, but I wish AF performance was better. I think the original question could be a bit broader, as I consider the M-system and a full Canon mirrorless strategy to be two different things. I think there needs to be a larger sensor mirrorless option in addition to the APS-C bodies. I don’t think the EF-M mount can be used with a 36×24 full-frame sensor (based on my measurements), but it could support an APS-H sensor (1.5x the area of APS-C) which would be acceptable in a body the size of the M3 (not sure the current EF-M lenses project a large enough image circle to cover APS-H though). (Canon actually just announced a 250 megapixel APS-H sensor, so we know they are working on this size.) When Canon introduces a full-frame mirrorless body, it probably won’t be in the M series and it probably won’t have an EF-M mount. I would still be very interested in a full-frame Canon mirrorless system as a compliment to the compact and portable M-system. The market leader here is obviously the Sony A7 series, so really Canon just needs to be competitive with those bodies. Full-frame sensor body wish list. Take all the advantages of any of the 1Dx or 5D bodies and remove the mirror, use an EVF, and that ought to about do it. 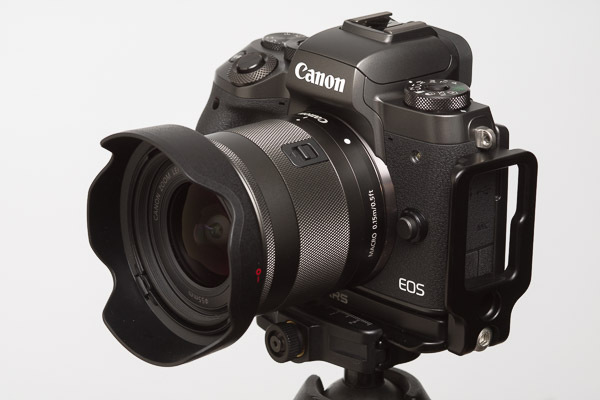 If a new mount with a smaller back flange distance than EF and a larger diameter than the EF-M mount is introduced, then it better support EF lenses at full-speed via an adaptor (Canon seems to be going fast and furious on the EF lens upgrade front so I’m not too worried about this one. I would actually be shocked if a third mount was introduced, but the EF mirror box space is such a waste). Autofocus seems to be the sticking point technology-wise. Getting mirrorless autofocus to be as fast as an SLR, even in low light and with fast moving subjects will be the Holy Grail. Reduce blackout times as well and SLRs will lose almost any advantage. There are times when an optical view-finder has advantages, but for 99% of my shooting, an accurate EVF and Live View are more useable. Some people ask, why make a mirrorless camera that just replicates the best of what SLRs already do (and have been doing for a long time)? The inverse question is the answer: why, if you could build a digital sensor mirrorless body with all the features of current SLRs (minus OVF) would you bother making a body with a mirror box and all the mechanics, noise, vibration, size, etc., that come with it? DSLRs only have mirrors because film SLRs had them, no other reason. Its time to move on.